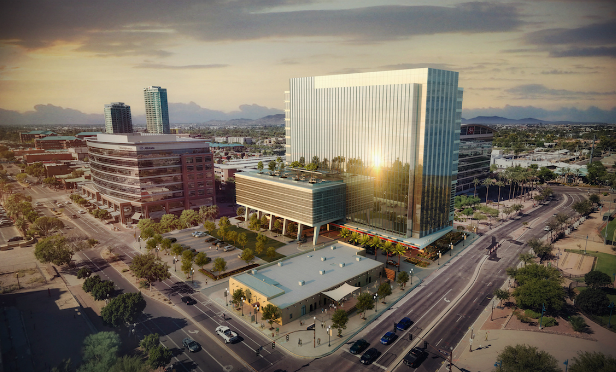 Hines and Cousins Properties are redeveloping the 2.5-acre former site of the Hayden House in to a modern office complex for Tempe’s high demand for office space. Downtown Tempe is growing rapidly, and there is a growing demand for large-blocks of office space. Hines and Cousins Properties are stepping up. A joint venture between the two firms is redeveloping the 2.5-acre former site of the Hayden House, the historic former home of Arizona Senator Carl Hayden at 100 Mill Avenue. The site will begin construction in the second quarter 2019, and will include a 15-story modern office tower as well as a hotel or apartment complex on a mixed-use.